At the time of the breakup of the Mohegan reservation in the mid-19th century, Medicine Woman Emma Baker revitalized the Corn Festival, which then became known as the “Wigwam.” Emma incorporated the Wigwam’s restoration into the goals of the Mohegan Church Ladies’ Sewing Society in 1860. By physically linking this festival to Mohegan Church in the year before the Mohegan Reservation began to break up, Emma focused tribal solidarity around the only post-reservation tribally owned land parcels. The building of the brush arbor required quite a lot of hours of hard labor. Eight or ten men cut the poles and this brush arbor was fifty or sixty feet square. This brush arbor was built in our churchyard. The poles were set eight or ten feet apart and they were crotched. Grey birch saplings were set across the top and woven across the sides so that it was completely enclosed. There was an entrance section left towards the east and there was an entrance towards the west close to the cook house. East and west doors had to do with early traditions. Tables were arranged inside and the festival was held Wednesday and Thursday and many visitors appeared for the midday meal: clam chowder, oyster stew, succotash and the famous traveling food—yokeag [ground parched corn], made of mortars of Pepperidge wood. Yokeag was used by hunters and warriors. It was light to carry and nourishing. We have been told that a small quantity was placed in a deerskin sack to be placed at the waist of the warrior or hunter and with water served as a meal. 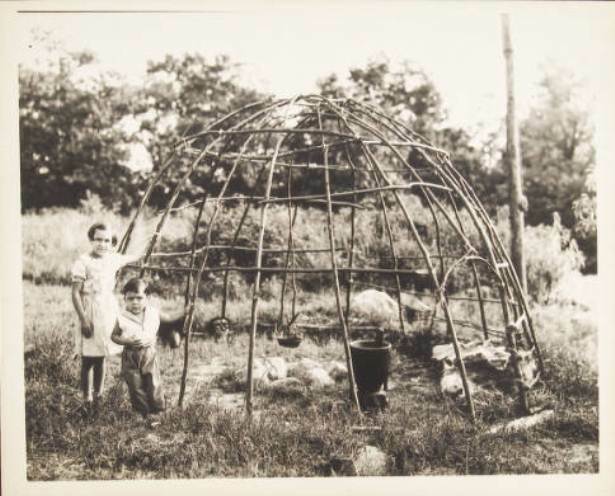 A Mohegan woman had a dream in which the spirit of her mother appeared and told her to tell the people to continue with their plans for the annual “Wigwam” or “Green Corn festival.” The message inspired the people, and with renewed courage they set to work determined to carry out the old custom, that it might please the spirits of the departed ones. The affair was a great success. Some of our elders who were basket makers, wood carvers and one or two who were doing a little work in some of the bead work. They didn’t think of that in terms of ‘Mohegan Indian Cultural Survival.’ That was just a part of everyday life. At the east end there would be one of our Mohegan men in his Indian clothes. He would be there to greet people. In early times, Chief Occum/Lemuel Fielding, and indoors the person who would take the entrance fee, which was fifteen cents. There were different tables arranged: first was the table with penny candy and one of the candies many of us liked was a round coconut candy and one chocolate; the next table was all baked goods, all sorts of cakes, pies. In the middle of the Wigwam was what they called the fancy table and the items women made during the year. You could buy a nice gingham apron. There were quite a few baskets made by our Indian men, cooking utensils such as spoons and ladles and one of our women did some beaded purses in floral designs. The more important tables were where they served the good food. One table served ice cream and some liked it with Yokeag [ground parched corn known as traveling food]. On the corner was the fortune teller; she read your palm. She was Jeanette Fielding; but, if she didn’t like the person she would not read their palm. She had practiced palmistry for a great many years. She would read your palm for fifteen or twenty cents and everyone said she was very good. Out in the cook house, Aunt Nettie [Fowler] and Chief Matahga with other Mohegans and some of our neighbors would get the corn husked, peel potatoes, and shell beans. This was an all-day affair for them through day and evening. The two-day Mohegan Wigwam event has always featured corn as its centerpiece, according to ancient custom. Real Mohegan succotash is served. Desert may consist of ice cream topped with yokeag, made from dried, parched corn, which has been ground finely with a mortar and pestle. Corn cob and corn husk dolls may be sold. Children sometimes play the game of ta-pa-neekan, made from a stick tied with bits of hollowed, dried corn cob tied in a row and a piece of fur at the end. The goal of the game is to catch as many pieces of corn as possible or, better yet, to catch the fur as it is worth the most points. Alongside corn, Mohegans traditionally grow squash and beans. These three plants are referred to as the “Three Sisters” as they nurture one another when they are grown together. Some Indian festivals, known as Pow Wows, derive their name from the Narragansett word “pauwaues,” meaning “shaman.” For its part, as a living tradition of welcome and celebration, the Wigwam is held every year at Fort Shantok in Uncasville, Connecticut, on the third full weekend of August. It is open to the public free of charge. “Emma Fielding Baker.” Connecticut Women’s Hall of Fame, 2013. Link. “The Green Corn Festival.” The Mohegan Tribe, 2013. Link.